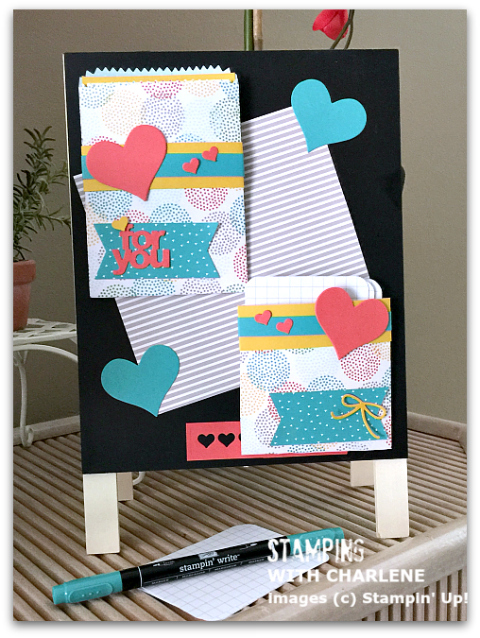 I created this “Love Notes” easel using Stampin’ Up!’s new Cherry on Top Designer Series Paper Stack and the current Mini Treat Bags Thinlits Dies. Before I explain the creation, I have to admit that I have a problem. Here goes: whenever I see a blank surface, I cannot leave it alone. It makes me crazy! I break out in hives when I see something like a plain notebook or a white paper gown at the doctor’s office. I just want to break out my cardstock and stamps and get busy decorating! That is exactly what happened to me the other evening when I was shopping with my daughter. I stumbled upon this lovely $3 chalkboard/dry-erase easel and I knew immediately that I had to buy it and do something with it to make it feel loved. I wanted to create something useful, so I came up with a “Love Notes” easel to leave in our kitchen. I made one pocket to hold blank pieces of paper, and another pocket to receive the love note. Isn’t it fun?! For the pocket that holds the blank note cards, I assembled a mini treat bag and then cut it in half. I used the Project Life Corner Punch to round the corners of the Project Life Grid Cards and placed the grid cards inside the shorter treat bag. Like most Stampin’ Up! 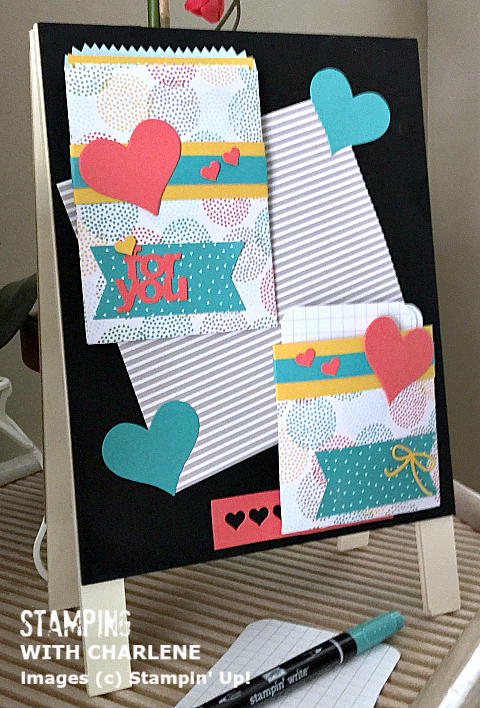 projects, this “Love Notes” easel makes a great DIY gift for a friend, neighbor, or teacher. You can adapt the theme to fit your needs. The best part is that it is really easy to make, especially because at 6″ x 6″, the new Cherry on Top Designer Series Paper Stack is already the perfect size to fit the large die in the Mini Treat Bag Dies collection. All you have to do is tear out two sheets from the stack and you are ready to go. Decorate the easel as little or as much as you would like.